Oh, hummus! It's perfect for every season and occasion. Having recently survived ACL knee surgery and off my feet for a few weeks, I longed for the days when I could do simple stuff on my own, like make my own hummus and wear normal shoes. Once I got my legs somewhat back, I reached for my trusty food processor. Can we talk about pumpkin? The level of pumpkin-ness has reached a whole new level of pumpkin this year. And I love it like I love Facebook, other people's selfies and Christmas music. I love perusing the pumpkin selection at Trader Joe's, scoffing at the sorry days when it was just a lonely can representin' for this time of year. I talked myself out of carving up my sugar pumpkin for Halloween, only to roast it with olive oil and salt a few days later. Just beautiful. And too beautiful to blend up for hummus, this time. However, the seeds were salvaged and roasted for hummus decor. Chickpeas, I'm giving you a Plays Well With Others T-shirt for whirling so well with pumpkin and soy. You made a delicious, rich, festive dip that I'm ready to groove to all season long. P.S. This is the hummus that gives you an excuse to make pumpkin chocolate chip cookies. Crack open that can for hummus, finish it with cookies. You're welcome. Blend everything but the chickpeas ad pumpkin in a food processor for about 20 seconds until all incorporated. Toss in chickpeas and pumpkin and blend until smooth, or to your desired consistency. What an interesting use of soy sauce! 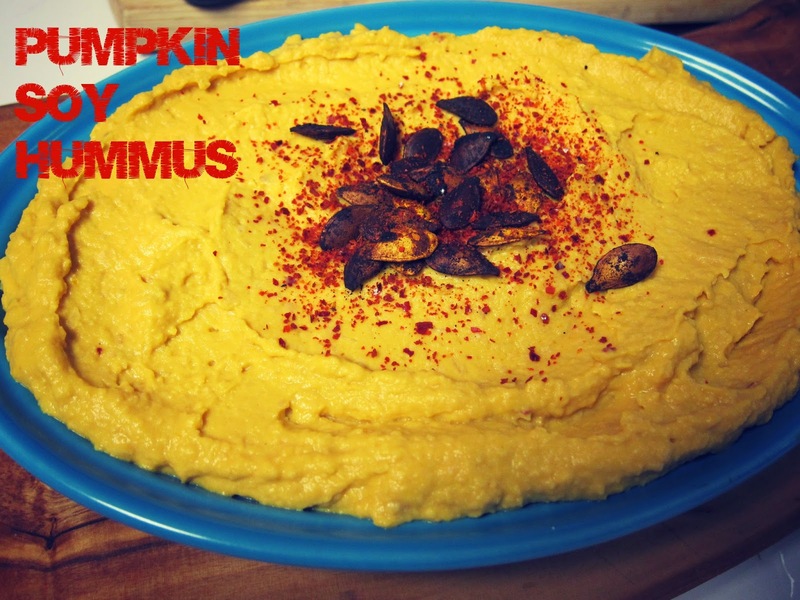 I will have to try that next time I make pumpkin hummus.